Jakeem Everett was 11 years old when members of a Fort Pierce, Florida, gang began to ensnare him. An A student who attended church faithfully with his mom and six siblings, he was an unlikely candidate for gang involvement. "I got tired of being picked on," Jakeem, now 21, says. "So I started hanging out with these kids in a gang known as the V-side." Gang members introduced him to marijuana and alcohol, and when he passed a gang test by getting high and drunk, they approached him about joining. He also passed the next test, to start a fight. From then on, his involvement grew quickly. "Life in the streets meant that you had to defend yourself or you would get beaten up or worse, shot at," Jakeem says. "So we carried guns to protect ourselves, and if you saw anyone from 'the other side' in our area, you had to take action or they would see you as weak and a potential victim. But I was still jumped, shot at and beaten up many times." Jakeem began fighting and skipping school, and eventually he was suspended. At age 13, authorities charged him with disturbing the peace and battery, and placed him on probation. He was only in middle school and had yet to cause serious harm, but he was walking a potentially violent path. In 2014, five homicides that involved juveniles as either the perpetrator or victim rocked Fort Pierce, a city of about 43,000. The Fort Pierce Police Department was already dealing with gang members and their "associates"—those "hanging out" with them. Current figures put the number of these individuals at 515, with 276 clustered around hot spots for violent crime in the three-square-mile area known as Lincoln Park. Convinced that the city needed to broaden its approach to gangs, members of the Roundtable of St. Lucie County, which brings together executive-level community leaders, began to search for a strategy. They attended a 2014 training presented by the Office of Justice Programs' National Gang Center on the Office of Juvenile Justice and Delinquency Prevention's Comprehensive Gang Model. This carefully outlined plan encourages communities to combat gang involvement by mobilizing local agencies and service organizations. "The model was the missing piece we needed," said Shaniek Maynard, former executive director of the Roundtable. "[Fort Pierce was] already involved in prevention and law enforcement efforts. The Comprehensive Gang Model offered a structure for all the elements that were going on, and a crucial piece on intervention." NGC and OJJDP specialists worked with Roundtable members to implement the model. First, the leaders assessed the community through surveys and focus groups to determine what residents viewed as the greatest challenge. Next, the specialists presented a full-day workshop, which 70 leaders and activists attended. The Roundtable received a big boost when 200 people gathered at a community meeting voiced their support for the Restoring the Village Youth Initiative, a joint effort with the police department, court system, schools and other agencies. NGC provided tailored technical training along the way—on hiring workers, and, for law enforcement, on gang investigations—all at no cost. "That is amazing, because all the other models we looked at charged for that assistance," Shaniek says. With the help of an OJJDP grant, the leaders formed an intervention team consisting of up to 20 agencies. The team first met in November 2015 and received NGC training. They hired a program coordinator and outreach workers who attended NGC training and began working with clients in November 2016. These outreach workers go into the streets, connect with gang members and their associates, and learn what makes each of them susceptible to gang involvement. The outreach workers connect their clients to critical services like job training and drug treatment, often going directly to their homes. The intervention team and Fort Pierce PD also collaborate on innovative policing strategies to stem violent crime. So far, the outreach workers and intervention services have helped or are helping 150 young people, all of whom participate in mentoring and social activities. Over 90 percent of those eligible have re-enrolled in school and are regularly attending, and three out of five have graduated. Over 70 percent completed training in job skills and/or gained employment, and 62 percent of those determined to have substance abuse, mental health or anger management needs participated in appropriate programs. Jakeem is one of those young people. 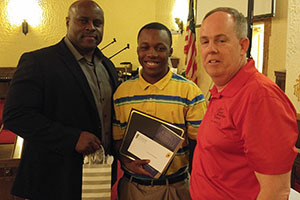 Since an outreach worker referred him to the program in 2015, he earned his security guard and provisional driver's licenses, held a job for more than a year, and is studying toward his high school diploma. He completed classes in anger management and saved money to buy a scooter for getting to and from work. Jakeem credits the outreach workers with helping him set and achieve these goals. "They mentored me, became father figures and gave me what most people couldn't ̶ fatherly love," he says. All this took time. "I was still living in the community, still hanging with my 'brothers,' though slowly but surely moving away from that life," Jakeem says. Monica Jakobsen, coordinator of Fort Pierce’s Restoring the Village program, has found that it takes up to two years for clients to extricate themselves fully from gang life. "It feels like two steps forward, three steps back because so many gang-involved youth have so many problems in their lives," she says. Meeting basic needs, such as finding affordable housing and transportation and earning a living wage, can be major hurdles. 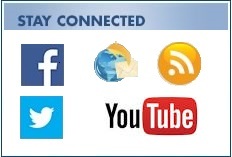 In addition, new problems can quickly set back progress, as Jakeem learned recently. While driving to work, he experienced a small car accident. Police charged him with three violations, and he landed in jail for 45 days. Although the court dismissed two of the charges, upon release Jakeem still owed a $600 fine. Thankfully, his employer allowed him to return to work. 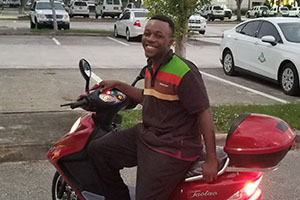 But the unpaid fine meant suspension of Jakeem's provisional driver's license, and his scooter needed repair. So he had to rely on others for transportation as he worked to catch up financially. Just six months later, Jakeem is managing two fast food restaurants. He is able to interview and hire other young men who are part of Restoring the Village. Crime has dropped impressively since Restoring the Village began to implement the Comprehensive Gang Model. From 2016 to 2017, violent crime that involved a known gang member or gang associate dropped nearly 56 percent, according to the Fort Pierce PD. This is more than 20 percent greater than the city's already-notable reduction in crime overall. "Communities can accomplish so much from admitting there is a problem and taking steps to solve it," Shaniek says. Fort Pierce has received a second grant from OJP, and NGC's involvement continues. "NGC has been a tremendous asset to me personally," says Monica, who consults weekly with advisors who have used the model in their own communities. 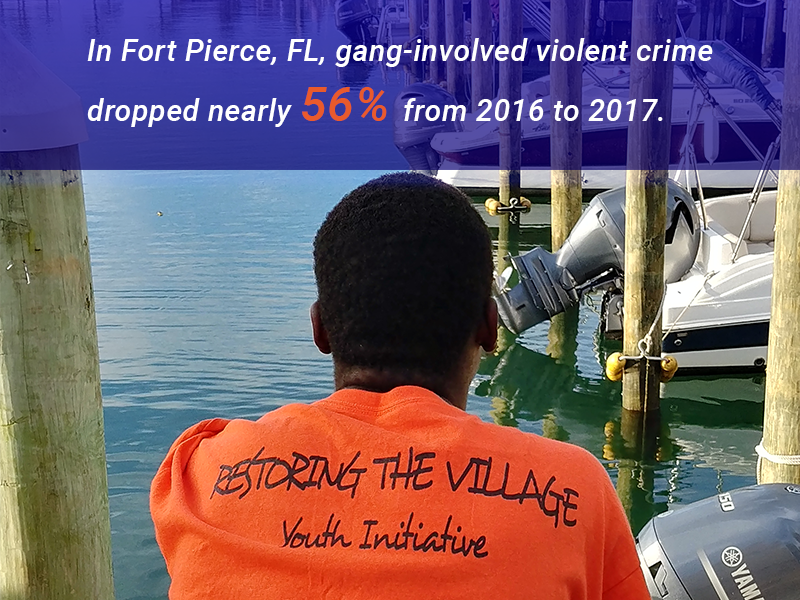 As its work with Fort Pierce shows, OJJDP delivers grants, training and technical assistance to help communities deal with gang-related problems. OJJDP's sister office in OJP, the Bureau of Justice Assistance, provides anti-gang training to law enforcement. Cooperatively, OJJDP and BJA provide nearly $3.5 million to support NGC services, programs and operations. "The progress in Fort Pierce is an example of the progress we can achieve," says Caren Harp, Administrator of OJJDP. "When communities fight gangs through enforcement, intervention and opportunity, they can accomplish amazing things."